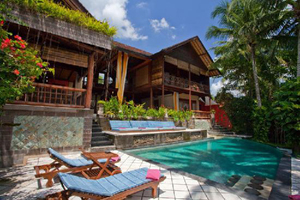 2nd Bali August Retreat Announced – Due to Popular Demand! Even though this retreat has just been released, it is half booked out already, so I only have seven places left! You could be one of those seven lucky people if you choose to join us at the August Embracing Life! Bali Retreat! So don’t delay – now is the time to make the decision and snap up one of these few last spots with just a $200 deposit! Bali is such a perfect place to do a retreat, and Ubud, the spiritual centre of Bali is a peaceful and idyllic setting, well away from the busy tourist areas. We settle into our little piece of paradise for our retreat on Sunday 12th August, and enjoy eight nights of not only a first-class health and detoxification experience, but we also explore the culture of Bali with some half-day trips and cultural ceremonies. At just $2795 for eight nights including all food and drinks, airport transfers, daily yoga, massage, colonics, lectures, workbooks, food prep classes with world class raw food chef Cat Cannizzaro, gift bags and much, much more – this is the perfect time to combine an overseas holiday and take your health to a new level! I laughed about the snoring!!!! Unfortunately in Bali the set up is twin-share as Villa Gaia is only quite small, it only has half a dozen (beautiful!) rooms available and they are two single beds and a share bathroom – they are a decent size, but still, the snoring is likely a problem. Ear plugs??? My dream in life is to join you on a retreat, I have started saving and hope to join to by 2013-2014. Thanks for all the wealth of knowledge you bring to us on a weekly basis. I also have problems with my thyroid and find your information very helpful. Looking forward to meet you in person. Many thanks…. Thank you so much for your kind feedback and words about my websites – I’m so pleased that you find the information helpful. We’d love to have you join us at a retreat, so keep in touch and we’ll see what we can organise for you. Bali is indeed a beautiful place to visit and have a relaxing retreat.. A great place to unwind and re-charge our toxic and stress bodies. Detoxification is an important process to keep our mind and body balance. Have you got dates for 2013 retreats yet? Hi Ritoo! At this stage I am not running any retreats in the early part of the year, as I am finishing a book I am writing – so the retreats will start up again with August in Bali, Byron Bay in September and Busselton WA in November. I am still finalising the exact dates, so they will be launched on the website early in the New Year. Thanks for your interest and I hope you can join us! Previous post: Are Your Stress Hormones Out Of Control?